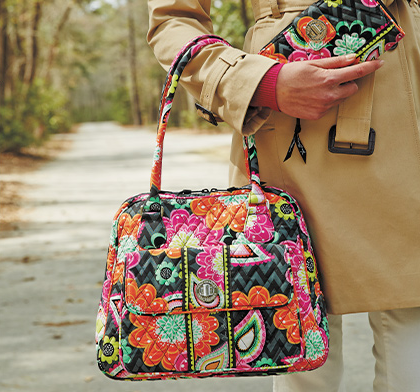 Up To 55% OFF All Vera Bradley Handbags, Fashion Accessories, Home Decor and More! You are here: Home / Great Deals / Up To 55% OFF All Vera Bradley Handbags, Fashion Accessories, Home Decor and More! Vera Bradley fans, have I got a sale for you! Starting today, you can save Up To 55% OFF All Vera Bradley Handbags, Fashion Accessories, Home Decor and More! With everything on sale from your favorite bag to a fun blanket or set of bibs for the baby you are sure to find just what you need. Prices starting at only $8.99 on various designs, colors and styles! Shipping starts at $5.95 and goes up $2 per item thereafter, however, you could buy 1 item, pay the shipping, and then get FREE shipping on everything else the same day through midnight!